Tacomob means “taking care of my own business” by the way, and I will add on my comments to some of the well-written verses mentioned by Andy. After reading, we may think that this is selfishness. However I interpret it to be more like, focus on improving oneself so that we can lead by example. Then our well-being can naturally be felt by others who need it. More importantly we should show sincerity, love and compassion to others by sharing the truth at least once. That is, even if there is strong revolt against us now, for one day they may realize the truth, repent and right the wrong. To Tacomob means having the courage to act instead of react. Be it in life or investment – Just "know and understand" is NOT good enough! “I am convinced that one has to take care of one’s own business and sort that one out first in order to be able to fully take care of others…..when you say your business is ‘to care for people you care’, then I would consider those people integral part of my business as well. Like Andy, I am convinced that without helping ourselves, how can we help others? 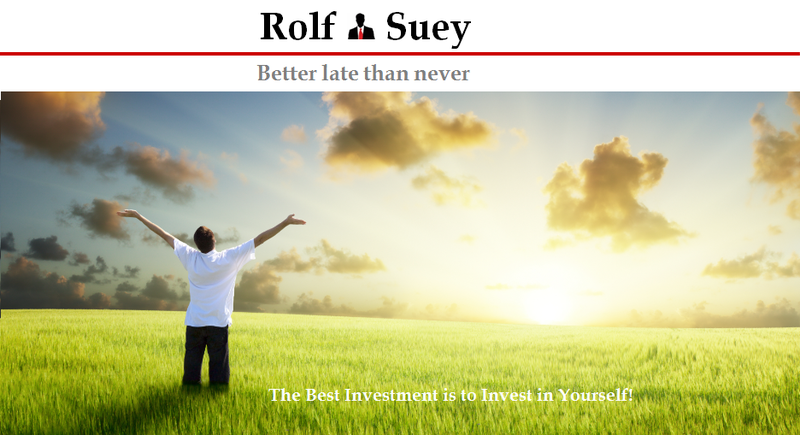 This message is so strong in me that my blog name Rolf Suey means “Yourself". And you can only finally rearranged the alphabets to “Yourself” when you truly know yourself deep down and understand the true meaning of life. It is just like an airplane instruction that during emergency, we adults help ourselves first before helping the children. Moreover for more profound problems people faced, we need the knowledge and resources to help others and not just helping with ignorance, which can turn out to be worst. Most relevant of all is Andy’s last sentence that we are even spending too much time helping people we hardly care about. I am very humbled and honored that you picked up my little blog post and enhanced it with your meaningful thoughts. Looks like our philosophies of life are a wee bit aligned. I should be the one thankful. After reading ur article, it cleared my thoughts about some of work related stuff I am having glitch about. My wife read also and commented that you are not only good in expressing ur points but in a manner that is so balanced without causing a big rant! Agreed. To be in the state of minding lesser others' "business" will be less stressful and worse is minding others' business with some performance level to be expected. Indeed... this happens many times in lives, house, work, friends etc. The chinese have put it very nicely in a proverb: The buddha (made of mud) crossing the river; Have difficulty helping himself, much less to help you!